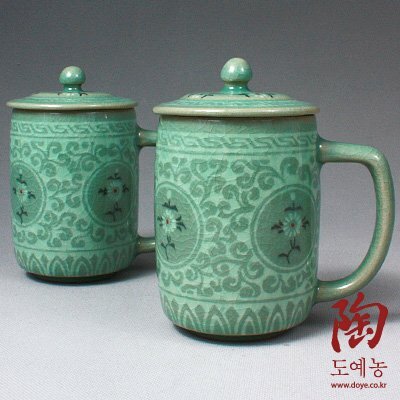 Each of these fine celadon ceramic mugs with lids exhibits the traditional inlaid chrysanthemum and arabesque design with the attractive jade blue glaze that bestowed Goryeo (918-1392) celadon with a worldwide reputation. One of the "four noble beings" (sagunja) symbolizing fidelity and loyalty, the chrysanthemum has been one of the most favorite subjects used for adorning craftworks as it blooms until late autumn, thus overcoming the frost. If you have any questions about this product by Antique Alive Tabletop, contact us by completing and submitting the form below. If you are looking for a specif part number, please include it with your message.